Q: How Can I Find and Contact a Local Reiki Practitioner ? A: There are 3 basic search options you can use to find a local Reiki Practitioner or an Event like a Reiki Workshop. Use the Search Bar at the top of the home page. Add your criteria and hit the search button. QUICK SEARCH BY REIKI CATEGORY feature. Simply scroll down the home page and click on the category you are interested in. When you use either option 1 or 2 above you will be taken to a results page. From here you can further refine your search by a) Keyword b) Zip/Postcode c) Category and d) Location. Q: Can I Call You On The Phone ? A: No. Sorry we can only offer eMail Support via our Contact Form which is located on our contact page. With so many members, students and members of the public spread across multiple continents and time zones, we have found eMail support to be the most efficient and effective form of communication. Please contact us now if you need help or support. Q: How Can I Contact One of the Reiki Practitioners in the Reiki Directory ? A: You should Contact the Reiki Practitioner or Reiki Master/Teacher you would like to talk to, or work, or train with directly using the contact information on their personal listing within the Reiki Practitioner Directory. We Cannot contact them for you, you will need to initiate contact directly with your local or preferred Reiki Practitioner using either their Website, Email or Phone contact details. Q: Why did you not reply to my contact enquiry ? A: We always reply to everyone who contacts us via our Contact Form. Unfortunately, sometimes our email replies do not get through to you because your email provider may have blocked our response, mistakenly thinking it was spam or junk mail. There is not a lot we can do if this happens; because we never normally find this out until you send us another message, complaining understandably that we are ignoring you and not replying to you. We pride ourselves on our support, and we are just as frustrated as you are when this happens. Once you make us aware of the issue, we will try other ways to contact you, using different business and personal emails addresses, and if that is unsuccessful we will try to connect with you on Facebook or Twitter. We always try to reply to your enquiry within 24-48 hours (Except at the weekends) – so please, if you feel we’re not getting back to you, check your spam or junk folder first, then white list our email address (support(at)reikihealingassociation.com) and send us another message via our Contact Form. Q: How will I know if I am Logged In ? A: If you look at the top left hand corner of the page, just above our RHA Logo, you will see a Welcome (Your Name) and the My Account link to your dashboard. Q: I have Forgotten my Username, What can I do ? Click on the Login link which is located on the Menu at the top of any page to be taken to the RHA Members Login Page. If these 3 options fail, please Contact Us using the Contact Form explaining that you have forgotten your Username and provide us with your Full Name and any email addresses that you may have used when you set up your membership account so we can try and track down your username for you. Once you find your username please make sure that you write it down somewhere safe and secure so you can always find it again in the future should you forget your username again. Q: How do I reset my Password ? A: There are just 4 simple steps to perform in order to reset your password. Step 1) Click on the Login link at the top of any page. Step 2) Click on the Lost Your Password Link, just below the login form. Step 3) Enter your R.H.A. Username or Registered eMail Address into the Reset Your Password Form and then click on the Get New Password button and our system will automatically send you an email containing a Reset Your Password link. Note: If you do not receive an email within 10 minutes, please check your spam or junk mail folder, just in case your email client has mistaken our email for spam. Step 4) Go to your email inbox and locate the email from the Reiki Healing Association with a subject line of Reset your Password. Open up the email, read the instructions and click on the link to reset your password. Q: How will I know if I am Logged out ? A: If you look at the top left hand corner of the page, just above our RHA Logo, you will see a Welcome Guest and 2 links Register or Login. Q: Can I change my Username ? A: No. Unfortunately, you can never change your RHA membership account username as it is locked down to your secure members account. That is why it is important to choose your Username wisely when you first register. We always recommend using your eMail Address as your username as it is unique to you, and it’s easy to remember. Q: I tried everything and I still cannot Reset my Password. Can you do it for me ? Do You Still Need Help Logging Into Your RHA Membership Account? If you are still struggling to access your membership account, then we can reset your password manually for you. Please contact us using our Contact Form and send us your Full Name, Registered eMail Address so we can track down your membership details. We will also need you to send us your New Preferred Password. Please Remember Your Password Must be at least 8 Characters in Length with No Spaces. We will then reset it for you manually on our membership system and send you an email confirming that it has been changed. Once we have changed your Password for you. Please Make a note of your Username and New Password for future reference. When you click on the My Account link at the top left hand corner of any page you will be taken to your membership account dashboard. 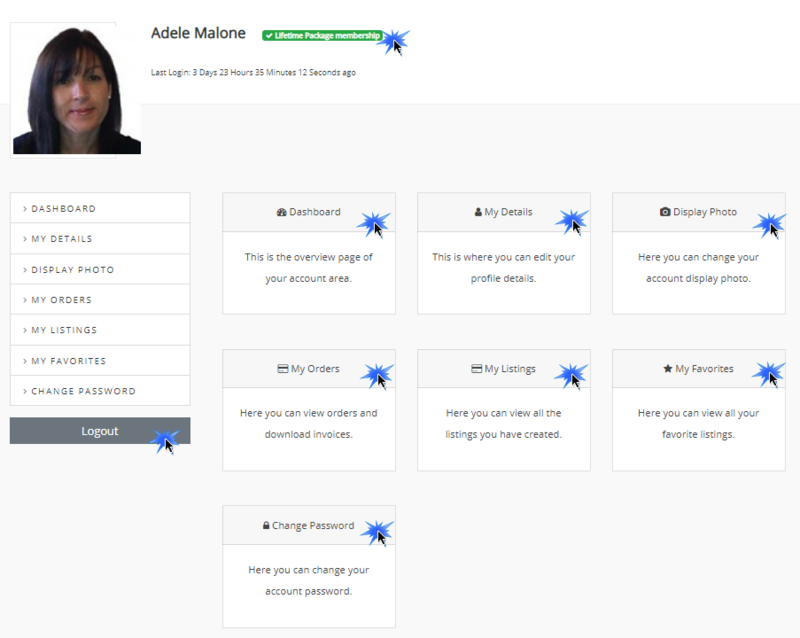 From within the dashboard area you will be able to edit your profile, add or edit a profile image, edit or add a new Listing, and upgrade your membership account. Here is a screenshot of what’s inside your My Account Dashboard. Q: What is a Reiki Business Listing? A: A Reiki Business Listing is your Permanent Professional Reiki Services Advertisement within the Reiki Healing Associations, Reiki Practitioner Directory. If setup correctly, you will only need to create your Business Listing once and it will remain in the RHA Practitioner Directory for the duration of your membership; helping to promote your Reiki Practice and/or Reiki Training School to members of the public who are seeking to find a Reiki Practitioner for a healing session or a Reiki Master Teacher for reiki training and certification. It’s a bit like an advert in your local Yellow Pages or in the Local Newspaper without the ongoing expensive fees. So it’s important that you spend a bit of time adding as much detail as possible to your Reiki Business Listing as it is after all your permanent Shop Window to the World. Q: What should your Reiki Business Listing be used for? A: You should ONLY add 1 (one) Reiki Business Listing within the RHA’s Reiki Practitioner Directory. This is where you will add your Name/Business Name, your location, your contact details, your promotional images and logo, and an overview/bio of your professional experience and the types of Reiki Products and Services that you offer. It’s your chance to talk about yourself and your own personal range of Professional Reiki Products and Services. You can talk about your professional qualifications and add information about any other healing modalities or professional services you can provide that maybe of interest to your prospective clients or students. Your aim should be to add as much detail about yourself and the services you can provide so that your prospective client or student connects with you and is motivated to contact you for further information or to book a session or workshop. You should create and add separate Reiki Event Listings for each of your upcoming Reiki Workshops or live events. Remember Reiki Event listings are temporary, they have a start point and an end point. Once the event (e.g. Reiki Workshop) is over you should login to your My Account dashboard and delete the event, so you are always up to date and relevant with your own upcoming Reiki Live workshop advertisements etc. You can add as many Live event listings as your Reiki Healing Association Membership package permits. Q: How to Add Your Reiki Business Listing? It’s really easy to add your Reiki Business Listing to our Reiki Healing Association Practitioner Directory. All you need to do is click on Add a Business Now button below to create your permanent Reiki Practitioner Directory Advertisement. You will then need to complete the online Business Listing form with all your information and hit the save button to add your listing to the RHA Practitioner Directory. Q: What is a Reiki Event Listing? A: Reiki Event Listings are a great way for you to promote your upcoming Live Events like Reiki Workshops, Reiki Shares, Reiki Meetups and Online Events like a Reiki Facebook Live Workshop, Seminar or Talk, to Potential Reiki Clients or Students searching for a local Reiki Workshop or Reiki share. Reiki Event Listings Must have a specific start and finish date. Anything other than a Live Event with a start and finish date should be added to your permanent Reiki Practitioner Business Listing. Q: How many Reiki Event Listings can I add to the Reiki Directory? A: This is dependant on the Membership Level you have subscribed to. So for example if you are a Bronze Member you can add up to 27 Live Reiki Events to the RHA Practitioner Directory every year for as long as your membership remains active. Adding time sensitive live events to the RHA Directory is a great way for you to promote all your one-off or regular Reiki Workshops or Reiki Shares etc to potential Reiki Clients and Students. Please Click on the Add Event Button Below to Add your Upcoming Reiki Event Now! Q: How much is the R.H.A. 's Lifetime Membership Package in my local currency ? A: We offer 4 types of Reiki Healing Association Lifetime Membership Package is just $97 USD. Please click on the Join Us link for more information. Although we are a global Reiki Association based in the UK; we use US dollars because they are the generally accepted currency of the net. If you would like to find out approximately how much $97 USD in your own currency, please visit one of the leading Currency Conversion sites on the net by clicking on the link below now. Q: Do I need Reiki Indemnity Insurance to join the Reiki Healing Association ? A: No. You do not require Reiki Indemnity Insurance in order to join the Reiki Healing Association. However, if you are going to teach and practice Reiki professionally, you should seriously consider investing in some Indemnity Insurance to protect yourself and your reiki practice. Reiki cannot do any harm. So you may wonder why you would need indemnity insurance. Well let say you are working from home and a client or a student falls over your door step entering your premises. They may bang and hurt their head, and decide that they are going to sue you. If your home or the healing centre you are working in doesn’t have proper insurance cover then you may have an issue. Another issue that may arise in the future, is that someone may steal or copy your intellectual property. You may need legal cover to protect yourself and your work. You should also check local business laws where you practice as some states or countries may insist that you have an indemnity policy in place before you can practice reiki professionally. Q: My order has not arrived yet ? A: As stated on all of our website sales pages; All of our products are 100% digital. So nothing is sent to you in the post/mail. If you have already registered and created your membership account; you can CLICK HERE to login to the secure members area now and access all your RHA Membership downloads. Please check the email account that you used when you placed your order to find the email from the team at the Reiki Healing Association that contains your username and password. You will need both in order to login and get instant access to the RHA members Area. If you cannot find an email from the team at the Reiki Healing Association, then please check your spam or junk mail folder before contacting us using the form below, stating your full name, and email address so we can find your order and re-send the email containing your login credntials to you. If you have ordered using a different name or email address, or someone else has placed the order for you, please send us their details also, so we can find your order. Q: Do you sell Advertising Space on the RHA.com website ? A: No. We only allow our own Reiki Healing Association members to list and promote their own Reiki and Healing Modality products and services on the Reiki Healing Association website. If you have a product or service that you feel our RHA Members and Readers would benefit from; please contact us via our contact form with the details of the Product or Service that you would like to promote and any special offers or affiliate program details link to the offer/product/service. We will then review the Offer/Product/Service and let you know if we will be able to add your offer etc to our next RHA Newsletter. Q: Do you have any articles about Reiki ? A: All general articles about Reiki are published on the RHA Blog which is accessible via the main menu at the top of the page or by clicking on the link below. Q: How can I write/add an article to the Reiki Healing Association’s Blog ? A: Guest blogging is a great way for you to add authority to your own Reiki Practice. Q: Do you have any Free Reiki Images for Marketing Purposes ? A: We do not have any free images that you can use for your reiki brochures, social media channels and general marketing campaigns etc. However, there are a lot of free image sites available. Please check out this blog post from Elegant Themes one of our WordPress Theme partners for more information on how to get free images to use on your website, blog or in your marketing campaigns. Q: What Web Browser should I use when I access the RHA Members Area ? Q: How do I unsubscribe from your mailing list ? A: It is really easy to unsubscribe from our mailing list, there is an unsubscribe link at the bottom of every email we send you, so all you need to do is simply click on the unsubscribe link and you will be automatically removed. If the unsubscribe link is not working, you can either reply to the email with ‘Unsubscribe Me’ in the subject line, or open a ticket using the RHA support Help Desk, requesting that we remove your email from our mailing list. Remember to include the email address that you would like us to remove from our mailing list. 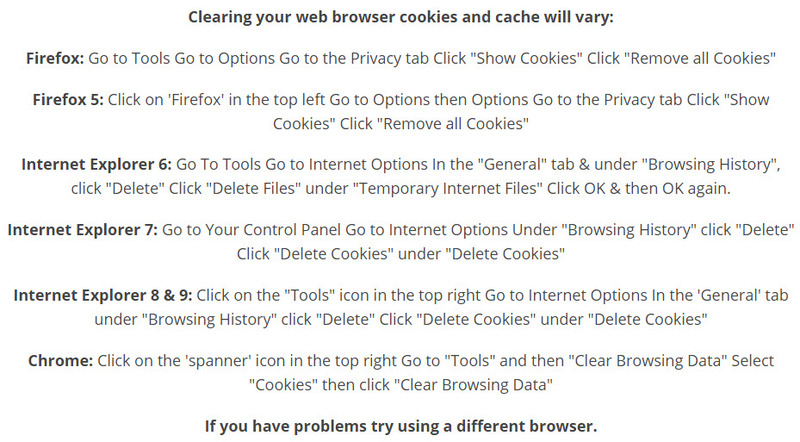 Q: How to Clear your Web Browser History/Cache ? Q: Why is the Link you sent me not working ? 1. Have you tried to copy and paste the link into your browser? 2. Or you could try holding down your ‘control’ key and then clicking. This overides your security/privacy settings. 3. Please try another web browser. We recommend Google Chrome, Mozilla Firefox and Microsoft Edge. If you still need help, please contact us now using the contact form below.